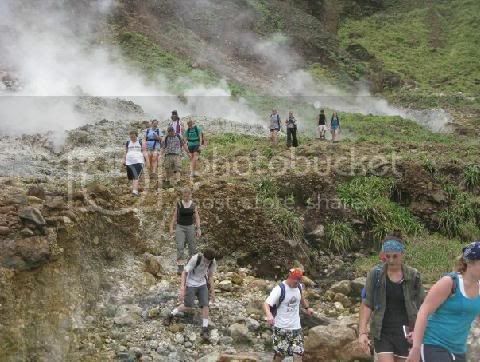 The Boiling Lake hike is one the most popular activities in Dominica. with its many unique streams of gray, white and black. This hike offers some of the most spectacular views into the heart of Dominica's rugged interior. The trail is sometimes very narrow with deep ravines on both sides. The Caribbean coast to the west and the Atlantic coast to the east. Like a giant green god, stands guard over the Valley of Desolation below. From the highest point, steam can be seen rising from the Boiling Lake in a distance. The dramatic descent into the Valley of Desolation now begins. There are hot fumaroles, which can burn you severely. There will also be some streams with water about 94 degrees F.
in these you can sit and enjoy the warmth. The minerals which the water contains, are said to be good for your skin. Can in relative terms be described as easy!! A strong gust of wind, could just push you over. The temperature in the lake is over 200 degrees F. need I say more! This is usually where lunch is eaten so that you can be rejuvenated for the long trek back. The climb out of the valley up Morne Nicholls is called "the gut buster". Bathing in the incredible and exotic Ti Tou Gorge at the end of the trail. This bounty at the end of a tough hike makes the whole thing seem like a pleasant dream. shorts, Tee Shirt, Hiking Boots or sturdy sneakers. Sandwiches, juice or water, a knapsack.